All Worship Sundays 9:30-10:30 On the first Sunday of the month from October – April, families attend worship together and participate in a service that all ages will enjoy. Families will be asked to be involved in the service in many ways. We will need acolytes, readers, greeters, ushers, communion servers, special music, and those who are willing to help with skits. Our Preschoolers will sing during the service. We would love to have others share their talents during this service. Following the service will be an intergenerational activity, a great time for us to be in community with each other and for us to learn from each other and from our older generation. Faith Formation Class Sundays 9:15-10:15 Traditional classroom setting for preschool/Kindergarten using the Spark Curriculum. 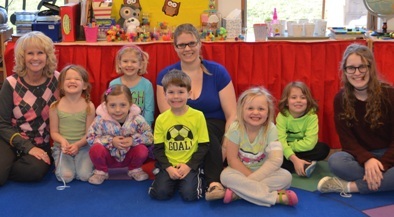 Preschool Music Miss Natalie will sing with the preschool/Kindergarteners during Faith Formation Class Sundays. The Children will have the opportunity to sing for the congregation at All Worship. Jesus and Me on Sundays at the 10:30 Service Children 3 years old through 3rd grade are invited to participate in JAM during the sermon. This is a time for our younger children to leave the service to do an activity or game.